Anubis is one of the most iconic gods of ancient Egypt. Anubis is the Greek version of his name, the ancient Egyptians knew him as Anpu (or Inpu). Anubis was an extremely ancient deity whose name appears in the oldest mastabas of the Old Kingdom and the Pyramid Texts as a guardian and protector of the dead. He was originally a god of the underworld, but became associated specifically with the embalming process and funeral rites. His name is from the same root as the word for a royal child, “inpu”. However, it is also closely related to the word “inp” which means “to decay”, and one versions of his name (Inp or Anp) more closely resembles that word. As a result it is possible that his name changed slightly once he was adopted as the son of the King, Osiris. He was known as “Imy-ut” (“He Who is In the Place of Embalming”), “nub-tA-djser” (“lord of the scared land”). He was initially related to the Ogdoad of Hermopolis, as the god of the underworld. In the Pyramid Texts of Unas, Anubis is associated with the Eye of Horus who acted as a guide to the dead and helped them find Osiris. In other myths Anubis and Wepwawet (Upuaut) led the deceased to the halls of Ma´at where they would be judged. Anubis watched over the whole process and ensured that the weighing of the heart was conducted correctly. He then led the innocent on to a heavenly existence and abandoned the guilty to Ammit. The ancient Egyptians believed that the preservation of the body and the use of sweet-smelling herbs and plants would help the deceased because Anubis would sniff the mummy and only let the pure move on to paradise. According to early myths, Anubis took on and defeated the nine bows (the collective name for the traditional enemies of Egypt) gaining a further epithet “Jackal ruler of the bows”. The growing power of the Ennead of Heliopolis resulted in the merging of the two religious systems. However, Osiris was the King of the Underworld in the Ennead and he was more popular (and powerful) than Anubis. So Anubis was relegated to a god of mummification. To save face it was stated that Anubis had voluntarily given up his position when Osiris died as a mark of respect. Some myths even stated that Anubis was the son of Osiris and Nephthys (who was herself associated with the funeral rites). Anubis was still closely involved in the weighing of the heart, but was more a guardian than a ruler. He became the patron of lost souls, including orphans, and the patron of the funeral rites. In this respect he overlapped with (and eventually absorbed) the Jackal God Wepwawet of Upper Egypt. During the Ptolemaic Period Anubis became associated with the Greek god Hermes as the composite god Hermanubis. Hermes was messenger of the gods, while Anubis was principally guide of the dead. Hermanubis was some times given attributes of Harpokrates. He was worshipped in Rome until the second century and was popular with Rennaisance alchemists and philosophers. 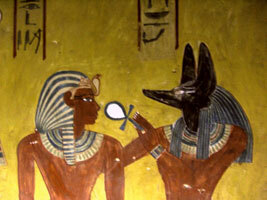 Priests wore Anubis masks during mummification. However, it is not clear whether the Anubis mask was a later development influenced by the Osirian myth or whether this practice was commonplace in the earlier periods too. 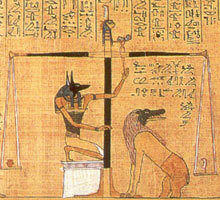 Anubis was also closely associated with the imiut fetish used during the embalming ritual. 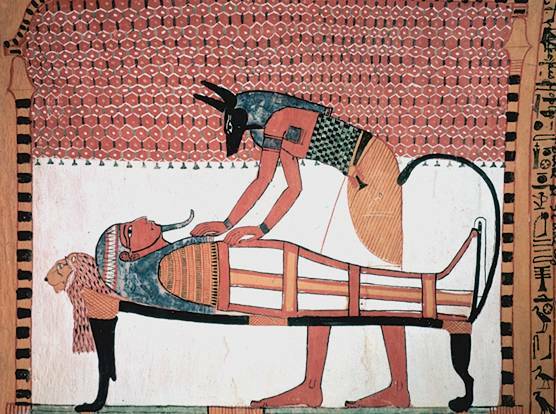 Anubis was credited with a high level of anatomical knowledge as a result of embalming, and so he was the patron of anaesthesiology and his priests were apparently skilled herbal healers. Tombs in the Valley of the Kings were often sealed with an image of Anubis subduing the “nine bows” (enemies of Egypt) as “Jackal Ruler of the Bows” and it was thought that the god would protect the burial physically and spiritually. One of his epithets, “tpy-djuf” (“he who is on his mountain”) refers to him guarding the necropolis and keeping watch from the hill above the Theban necropolis. He was also given the epithet “khentyamentiu” (“foremost of the westerners” i.e. the dead) because he guarded the entrance to the Underworld. He was originally thought to be the son of Ra and Hesat, Ra’s wife (who was identified with Hathor), but later myths held that he was the child of Osiris and Nephthys, or Set and Nephthys. 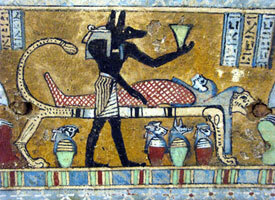 He was sometimes described as the son of Bast because of her link to the perfumed oils used in embalming. His wife, Anput (his female aspect) was only really referred to in association with the seventeenth nome of Upper Egypt. It is thought that they were the parents of Kebechet, the goddess of the purification. Dogs and jackals often patrolled the edges of the desert, near the cemeteries where the dead were buried, and it is thought that the first tombs were constructed to protect the dead from them. Anubis was usually thought of as a jackal (sAb), but may equally have been a wild dog (iwiw) He was usually depicted as a man with the head of a jackal and alert ears, often wearing a red ribbon, and wielding a flail. He was sometimes depicted as a jackal (such as in the beautiful examples from the tomb of Tutankhamun) but only rarely appears as a man (one example is in the cenotaph temple of Rameses II at Abydos). 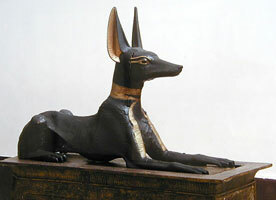 His fur was generally black (not the brown associated with real jackals) because black was associated with fertility, and was closely linked to rebirth in the afterlife. In the catacombs of Alexandria he was depicted wearing Roman dress and the sun disk flanked by two cobras. Anubis was worshipped throughout Egypt, but the center of his cult was in Hardai (Cynopolis) in the the seventeenth nome of Upper Egypt. To the east of Saqqara there was a place known as Anubeion, where a shrine and a cemetery of mummified dogs and jackals was discovered. He was also worshipped at cult centers in Abt (the the eighth nome of Upper Egypt) and Saut (Asyut, in the thirteenth nome of Upper Egypt).